Without fail, every few months or some period of time, I have to return back to one of my favorite perches at Disneyland--the top of Tarzan's Treehouse--and post a photo of the view. And most of the time, it's that angle toward the Haunted Mansion and Splash Mountain, ideally with some sort of interesting sky to add to the scene. In the photo below, the skies aren't quite as vibrantly pink or purple as I would have liked, but the orange glow is still something more enhanced than normal, and it provides a nice background texture for this compressed perspective scene. 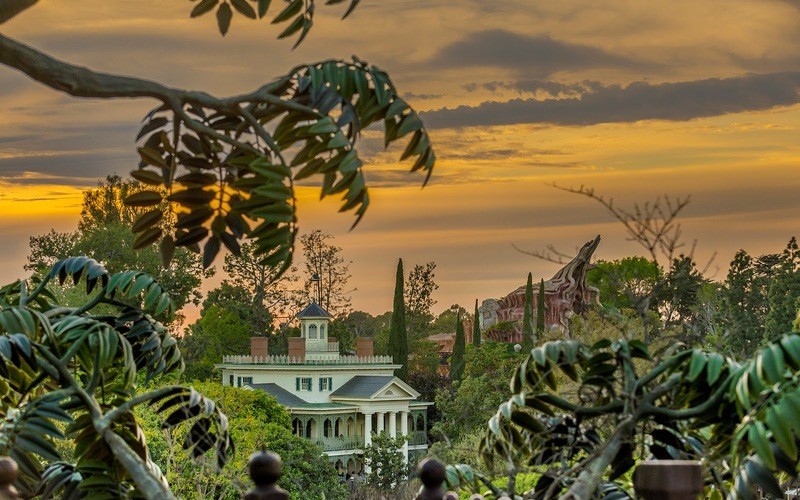 A dusty sunset streaks over the Haunted Mansion and Splash Mountain.